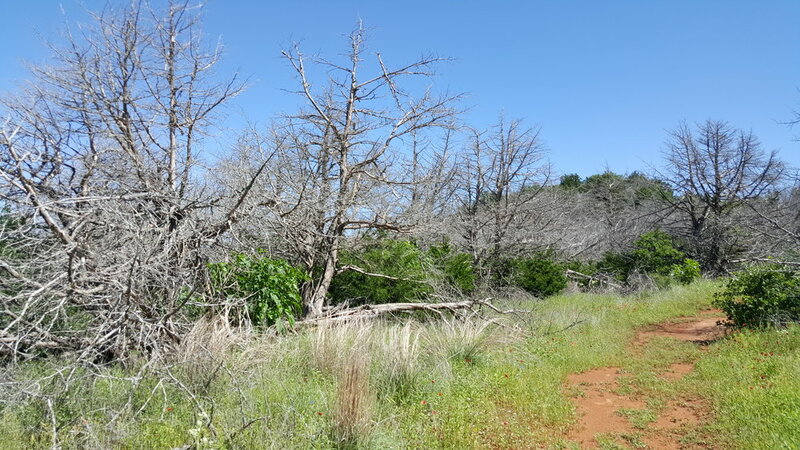 Tree mortality at Red Rock Canyon State Park, in Caddo County, Oklahoma, USA. Red Rock Canyon State Park is known in the tree world for harboring the last remaining native populations of the Caddo maple (subsp. of Acer saccharum). My task was not in the canyon, however, but in the surrounding upland areas. As we climbed out of the canyon, it became clear that there was widespread tree death. 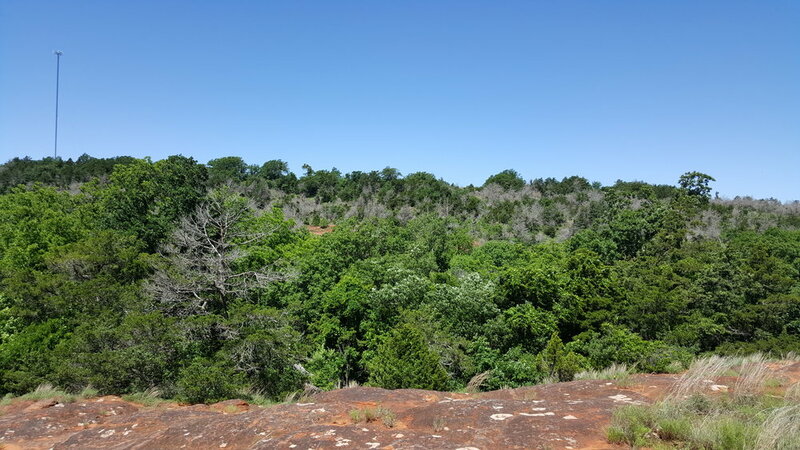 Large, overstory trees of eastern redcedar (Juniperus virginiana), Blackjack Oak (Quercus marilandica) and Post Oak (Quercus stellata) were impacted. While I did core surviving trees, I have not attempted to age anything yet. My best guess is that trees well over a hundred years old died during this event. Trees that were dead seemed to occupy sites with steep slope, irregardless of aspect. While I am unfamiliar with the soils in this area, they seemed shallow, as bedrock was visible on the surface in many places. Understory trees seem to have been less effected overall, and the seedling layer is dominated by the same three species which experienced the greatest overstory loss at this site. What killed the trees at Red Rock Canyon State Park? While I am new to the scene, it seems that droughts which peaked in 2010/2011 must have played a part in this event. When thinking about the size of the trees that died (measured several > 50cm dbh), it gives pause that perhaps it was not the drought alone, however. Did temperature extremes also play a role? How old were the oldest trees that died during this event? Why were understory trees not impacted? While there certainly are more questions than answers as to what happened at Red Rock Canyon, perhaps an answer will emerge with further work in the area. I am hopeful our lab can characterize the mortality that has occurred. Interesting projects would include measuring trees that died and survived, taking cookies from dead trees and cores from survivors to compare growth leading up to death (or survival), identifying site characteristic differences of dead trees and survivors. 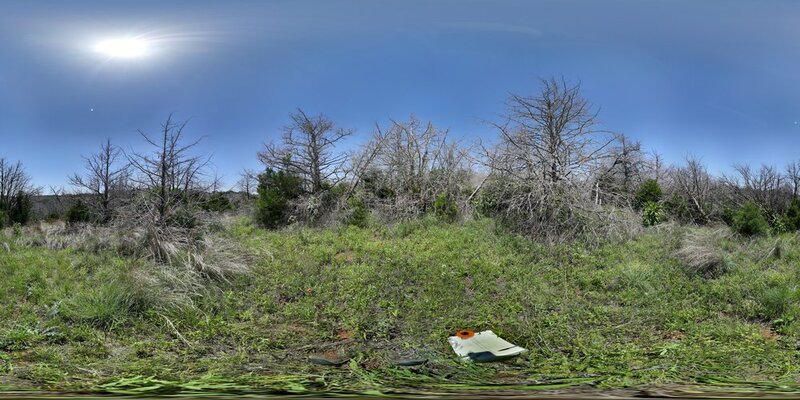 While some of this information was captured during the transect work I conducted as a part of my larger Cross Timbers mortality survey, an event of this magnitude needs to be characterized more thoroughly.